I’m not a total novice, but I wouldn’t even attempt to make some of the cakes and pastries I see on Damaris', Terra's, and Becca's Instagram feeds. But when this challenge rolled around, I was still up for it. I wanted to make something I hadn’t before and prove to myself that even candy-making can’t be quite as difficult as it seems. And if there is one candy I love, it’s caramels! After plenty of Internet searching, I decided that I would just jump in and try it. And it seemed like it could actually be done in 20 minutes (plus a little extra time to cool)! The big trick here is that you need a candy thermometer, a tool I didn’t have in my kitchen for a long time (and one that I finally found in the very back of my drawer!). It’s worth picking one up—they only cost a couple of bucks. 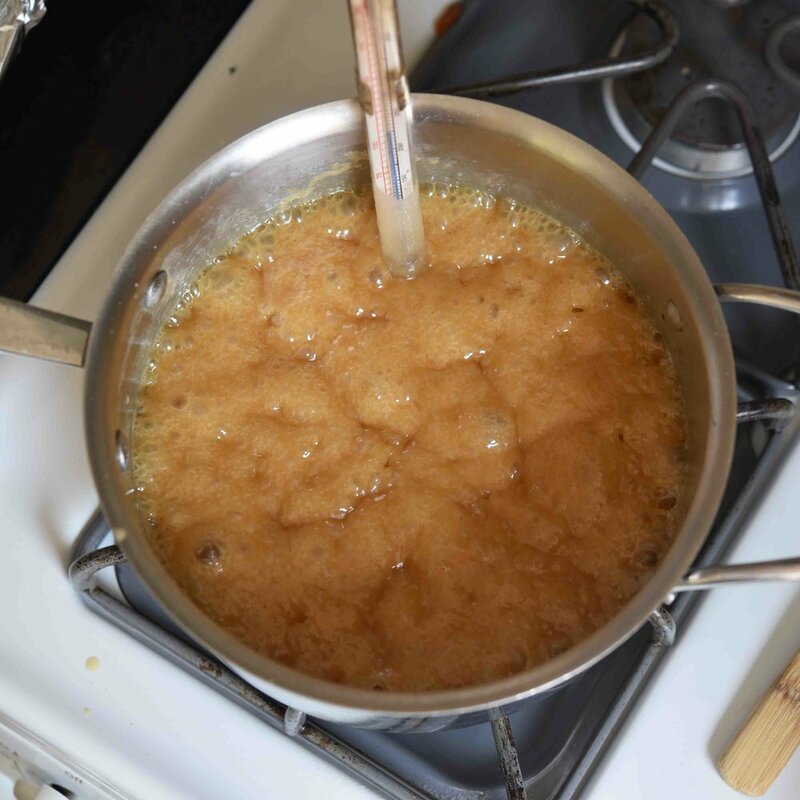 I used a recipe that had corn syrup and brown sugar, and I would credit the recipe to someone, but it seems everyone is using the same recipe, so I couldn’t say who actually wrote it. But to me, especially since it was my first time, I wanted some sort of guarantee, and I never claimed to be a candy-making chef extraordinaire anyway, so let’s not focus on the details. A little less than 20 minutes later, and amazingly I had caramel! Brushing the sides of the pan with a wet pastry brush and vigilantly watching the thermometer were the only “difficult” things. Other than that, you're really just throwing stuff in a pot and cooking it. And just imagine how impressed people will be when you bring these out at the end of a meal or give them as gifts. 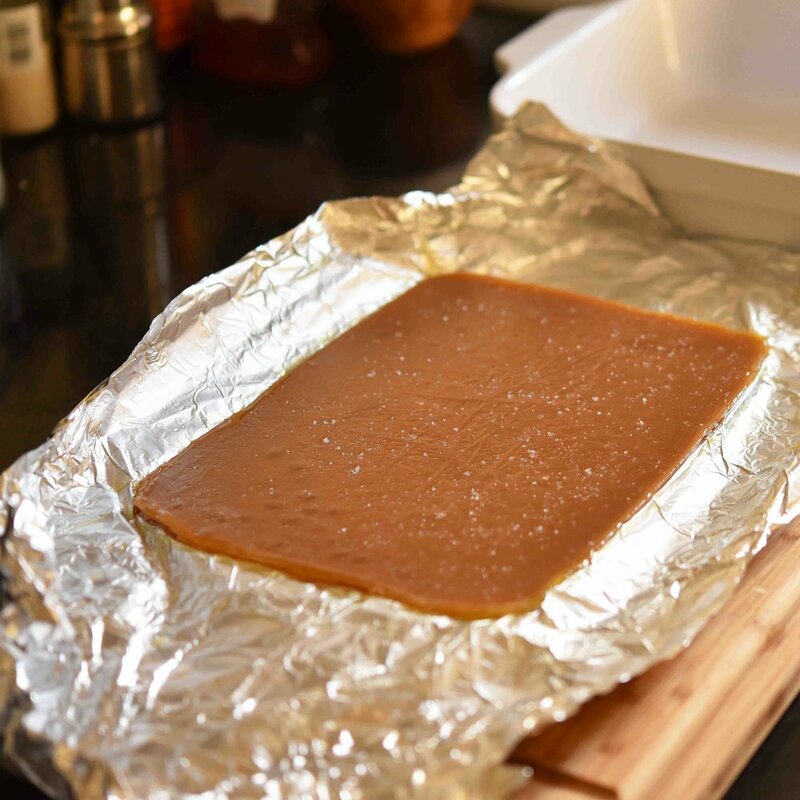 Line a 2-quart baking dish (8 by 8 inches or 11 by 7 inches) with foil, leaving the edges of the foil hang over the sides of the pan (so it is easy to remove the caramels once they are finished). Then lightly grease the foil with butter or spray with cooking spray. 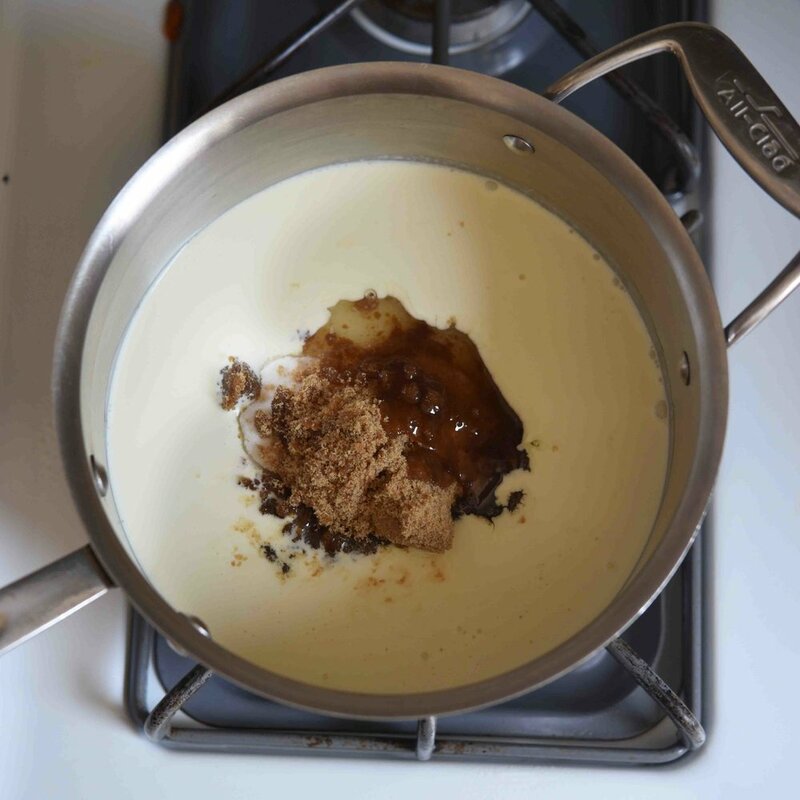 In a large sauce pan over medium heat, combine the cream, granulated sugar, brown sugar, and corn syrup, stirring constantly until the sugars are fully dissolved and starting to thicken—3 to 5 minutes. Once boiling, clean the sides of the pan with a damp pastry brush. Then, without allowing it to touch the bottom of the pan, insert a candy thermometer; continue to cook, stirring occasionally, until the temperature reaches 245°F—10 to 12 minutes, then immediately remove the pan from the heat. Slowly stir in the butter, vanilla, and salt, being careful as the mixture will bubble up significantly. Pour the mixture into the prepared pan, sprinkle with the sea salt, and transfer the pan to the fridge. Cool the caramels uncovered until set—at least 2 hours. 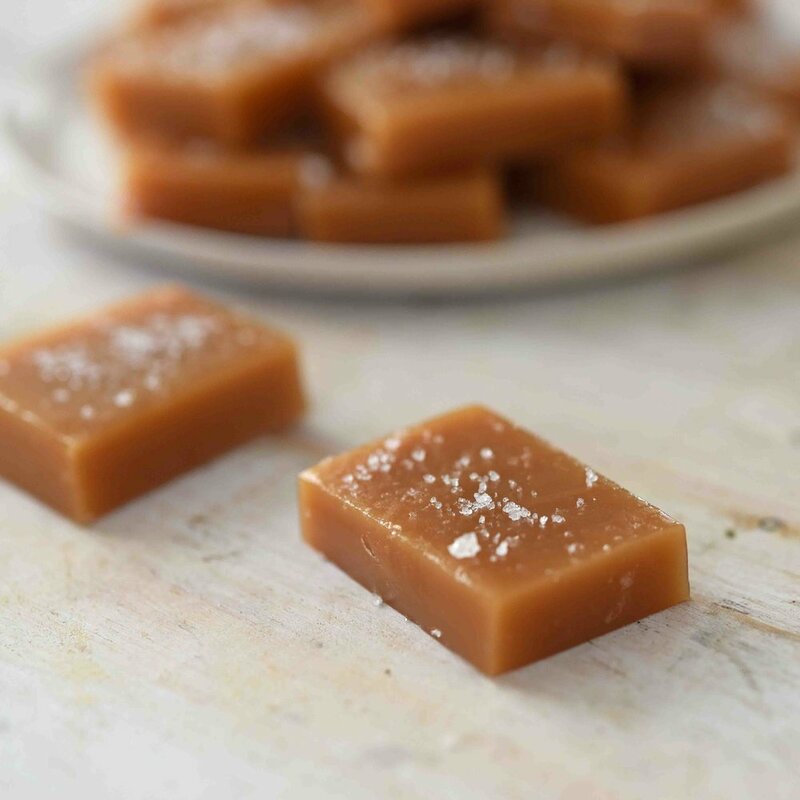 Remove the caramels from the pan and, using a greased knife, cut into 36 rectangles. Wrap in candy wrappers if desired and store at room temperature (not in the fridge).